Thirty-seven rows, four police officers in each, stood at attention. It was their day off, a sunny Saturday morning, but they were up and in uniform to pay respects to a fellow officer, whom, until recently, almost no one knew existed. Sergeant Horatio Julius Homer, Boston’s first African-American police officer, was about to receive his long-verdue recognition. Hundreds of police officers, city officials, and minorities remembering a local pioneer embraced the city’s newfound history yesterday at a ceremony to memorialize Homer’s life and finally mark his grave, which had lay hidden in Plot 1,001 at Evergreen Cemetery in Brighton for 87 years. “We pray, dear God, that we would be reminded of his strength, his fortitude, his integrity, and his courage,’’ said Rev. Gary Adams, the police department chaplain, in the invocation. The city had long believed its first black police officer was hired in 1919. But Boston police archivist Margaret Sullivan, acting on a mention in an 1890 book, recently set out to debunk that myth. In 2008, she did, eventually finding five black police officers in the city prior to the 20th century, but none earlier than Homer, who was hired on Christmas Eve 1878. She then began digging for information on Homer, believed to be the second black police officer in the country, and his story unraveled. Homer was born in Farmington, Conn., in 1848, when slaves were still held nearby. After brief stints as a waiter and a railway porter, his work ethic and a bit of luck earned him a shot in the Boston police department — then-City Councilor John Jay Smith was an abolitionist eager to get a black man on the force, and the man who was then chairman of the board of police commissioners, Henry Sturgis Russell, was open to change. Homer became well respected in the department, Sullivan said, encouraging the hires of four other African-Americans. By 1895, he was promoted to sergeant. 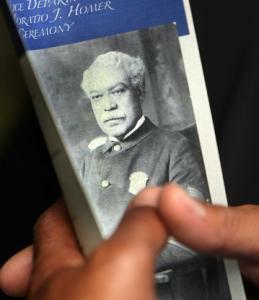 But by 1903, he was again the only African-American on the force, “a relic from a more tolerant age,’’ Sullivan said. He retired at 71 in 1919, having lasted 41 years and through 12 police commissioners. That longevity in the face of adversity astounded officers at the ceremony. Homer’s two granddaughters were told by several speakers that they were now a part of the Boston Police family. “All I could see was blue,’’ added her sister Lillian, referring to the sea of uniformed police. Most of the officers were on vacation or had taken the day off, many noting they felt compelled to come. City councilors, state lawmakers, and even independent gubernatorial candidate Timothy P. Cahill showed up. Ayanna Pressley, the first woman of color elected to the Boston City Council, said she and fellow councilors will push to name the new police station in Dudley Square, located in Homer’s final district, after him. At the end of the ceremony, Police Commissioner Ed Davis and Mayor Thomas M. Menino pulled a black sheath off Homer’s new tombstone. His granddaughters bowed their heads, looking on with arched eyebrows of sorrow and respect. Shots rang out for the 21-gun salute, and then a trumpet began to play Taps. Jack Nicas can be reached at jnicas@globe.com.